Wow, I can't believe another year has gone by already. Well, this birthday certainly feels a lot different from when I turned 23. It's been a bit of a crazy year of ups and downs like getting to go to Thailand and London for the first time (up) and getting laid off...twice (down). But I'm still grateful for it all because everything happens for a reason and without it I wouldn't be here. I have a much more realistic view of where the media industry is going and have pushed myself to try new things like pitching publications I used to dream about writing for and working on paid deals with brands on my blog and YouTube channel. I'm also grateful to have the best family and friends along for the ride with me because without them, I'd surely have gone insane by now. 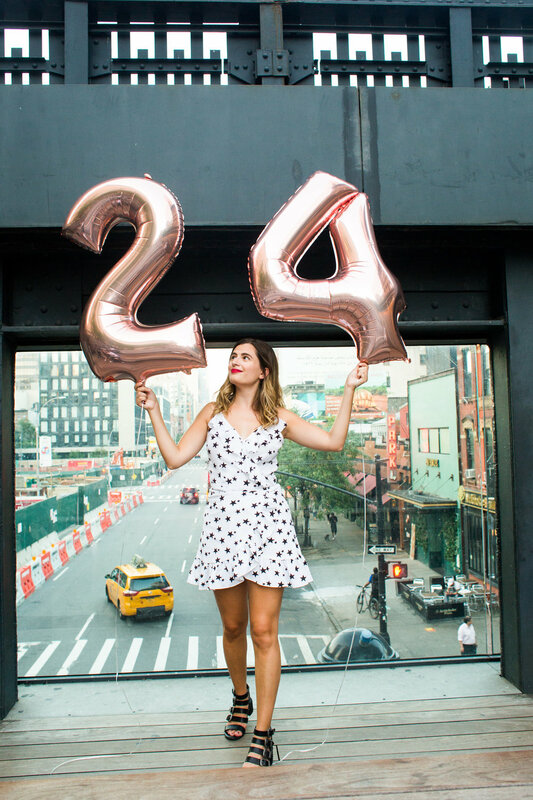 So since I just did a lot of reflecting on my life in my five years of living in NYC post, I figured that it would be more fun to share some things about myself with you that you might not know about me. So here are 24 fun facts, get to know you's or whatever you want to call them. I can't wait to see what the next year has in store. 1. I'm an only child. 2. I love trapeze! I took a class at a performing arts camp one summer when I was little and occasionally take them in NYC now too. 3. My Myers-Briggs personality type is ENFJ. 4. I live in Williamsburg, Brooklyn and I love it. 5. I'm literally obsessed with skincare. I'm always trying out new products, serums, moisturizers...my bedroom is overloaded with products at all times. 6. I never had any pets growing up but I currently live with my roommate's cat whose name is Sassy. Her personality matches her name. 7. The first time I ever dyed my hair I was 17. 8. There are few things I love more than having board game nights in my apartment. 9. My all-time favorite T.V. show is Gossip Girl. 11. I drink my coffee black, and have for a few years now. 12. If I could only eat one food for the rest of my life it'd be pizza (and I did only eat it for a week once). 13. Fashion is one of my favorite things in the world. It's the best way to express yourself without saying a word. 14. My favorite stores are ASOS, Topshop, Mango, and Free People. 15. My shoe size is 8.5. 16. I wear glasses! I'm almost always in contacts because I'm so used to them now but if you've ever watched my Instagram stories you've likely seen me in glasses. 17. In college I majored in art history. I almost picked up a philosophy minor because I found it so interesting but didn't have time to complete the credits. 18. I went to Barnard, an all-girls college. 19. My beer of choice is an IPA and my wine of choice is merlot. 20. I joined Twitter in 2009, which is wayyyy early but I didn't get Instagram until 2012. 21. I grew up in New Jersey. 22. I really can't cook but I can make a few simple breakfast dishes. 23. I can't walk in super high heels. Chunky heels for life! 24. I'm extremely grateful to this blog for being a place that I can express myself in any way I'd like. Having this little corner of the internet means everything to me.